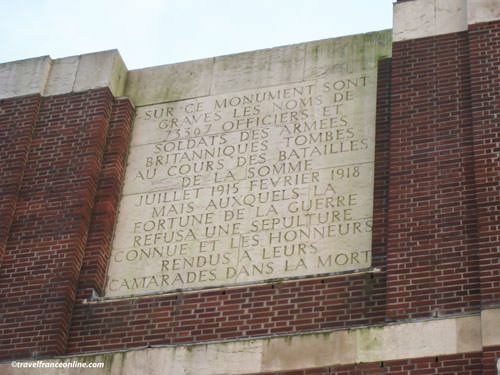 Thiepval is located in the department of Somme in Picardie. The Germans invaded most of Belgium and Northern France in 1914. The Battle of the Somme, the main Allied offensive of 1916, took place north of the river Somme, where the British and French armies met. It lasted from July 1 to November 18. The assault was brought forward after the massive offensive launched by the Germans against the French in Verdun. 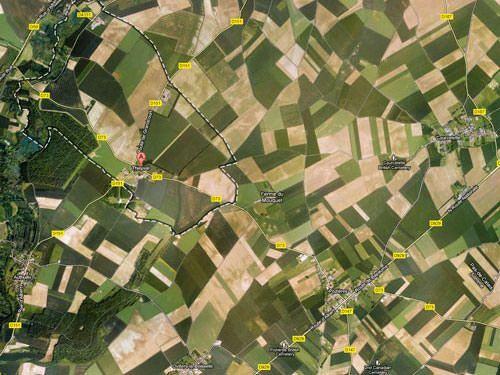 The Somme is a region of rolling hills that provided natural elevated positions for the Germans' defense system. It obviously left the Allies at a neat disadvantage in the lower grounds. 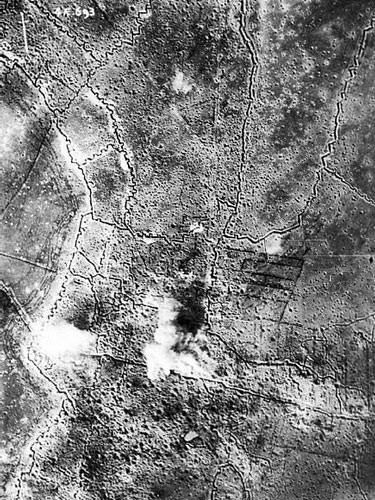 The preliminary artillery bombardments had very little impact on the German highly fortified redoubts when the battle started on July 1, 1916. The Allied High Command naively thought that their troops would just have to sweep steadily across wide front lines and capture the German shattered trenches. However, as soon as the assault started, they realized that the Germans' defense had suffered minor damage. The weeks that followed were marked by a series of small victories followed by withdrawals, and therefore very slow progress. A stalemate that tragically claimed the lives of thousands of men! The Battle of Flers-Courcelette, on 15-22 September, however, marked a turn in the Battle of the Somme. Tanks - a then new weapon! - were indeed brought in and deployed across the whole of the assault front. The results were impressive, as twice as much ground was recovered than on the July 1 attack, with half the number of casualties! Thiepval Ridge Battle (September 26-28 , 1916) was the largest and first offensive led by the British Reserve Army during the Battle of the Somme. Thiepval was a major German defense area located to the north of the British front. The village spread on the top of a ridge; the surrounding land consisted on marshes. The ridge had extensive views over the Ancre Valley and countryside for kilometers around. The Germans built an extensive defense system of defense at the beginning of the war. It consisted of highly fortified redoubts interconnected by trenches, dugouts and very deep tunnels defended by machine gun nests half way downhill and in a line of about 2km. They spent the following months improving and strengthening their defense. They therefore installed additional machine gun posts in the cellars of the houses of Thiepval, turning the little village into an impregnable fortress! 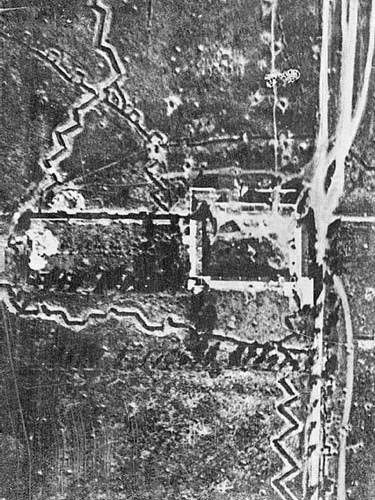 The main objective of the Battle of Thiepval Ridge was obviously to dislodge the Germans, but also from the highly fortified redoubts located farther down the hill. These included the Zollern redoubt near the Mouquet Farm to the northwest, the Stuff and Leipzig redoubts to the south and the Schwaben redoubt between the present day Thiepval Memorial and Ulster Tower. However, the Schwaben redoubt was the most fortified and impressive of all. German troops from Swabia (a southwestern region of Germany) built it early 1915, hence its name Schwaben Schanze (Swabia earthworks). It indeed had deep galleries that linked it to the Zollern redoubt near the Mouquet Farm, the front line trenches and the village of Thiepval. The Allies knew this sector of the German defense as the 'Leipzig Solent'. Thiepval Ridge Battle was preceded by a 3-day of intensive bombardment, which unfortunately had little effect on the highly fortified Schwaben Redoubt and Thiepval village. Several Infantry Divisions launched the assault on September 26 at 12.35pm, over a 2km wide front. The Canadians attacked from Courcelette to the northeast. They indeed captured this fortified sector, a few days before, during the Battle of Flers-Courcelette. They took control of Thiepval Ridge base, however, were stopped in their progress at the level of the 'Regina Trench'. The massive German trench indeed ran from Courcelette almost all the way up to Thiepval! This attack tragically resulted in an enormous number of casualties among the Canadians. The 11th Northern Division started their assault by the Mouquet Farm, to the west of Courcelette and progressed towards the Zollern redoubt. They suffered heavy casualties, but established their position at the edge of the redoubt. The 18th Division was positioned farther west and conducted a systematic advance uphill on Thiepval, but were slowed down by the German counter attacks. However, they eventually captured most of Thiepval in the early afternoon, then neutralized Zollern and Stuff Redoubts. They established full control of Thiepval village the following morning! The capture of the Schwaben Redoubt on September 28 put an end to the Battle of Thiepval Ridge. This successful and relatively swift offensive, however, resulted in an astronomical number of casualties. 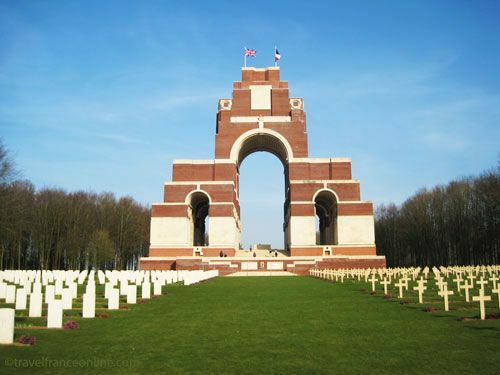 Sir Edwin Lutyens designed Thiepval Memorial to the Missing. The imposing memorial pays tribute to the Soldiers who Fell in the Somme before March 20, 1918 and have no known grave. Those who died after that date are commemorated in the nearby town of Pozières. In 1917 the six Commonwealth countries - Australia, Canada, India, New Zealand, South Africa and United Kingdom - decided of the creation of a joint-funded War Graves Commission in order to commemorate all the war Dead individually and 'in a uniform and equal fashion, irrespective of military or civil rank, race or creed'. 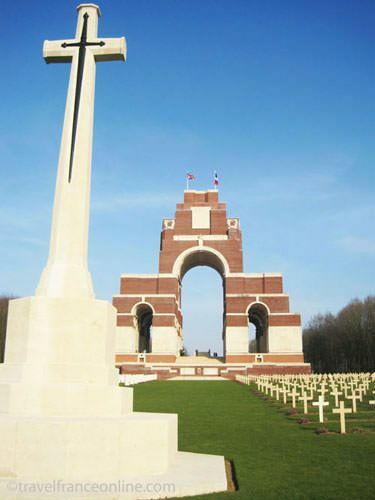 At the end of WWI, Thiepval was chosen for the construction of an imposing Memorial to the Missing. The site was bought in the 1920s. The Prince of Wales, who was then the president of the War Graves Commission, unveiled the memorial on August 1, 1932. Thiepval Memorial to the Missing is the largest and most impressive of all the memorials to the Missing. It was also the first memorial of the Western Front Memorials to be unveiled. The Prince delivered his speech both in English and French in front of the families of Fallen Soldiers and War Veterans. “ our thoughts today should be with the relatives of those whose death has purchased our current freedom”. I recommend entering the site through the Visitors Centre - Interpretative Centre. This modern glass fronted structure was inaugurated in September 2004. It proposes audiovisual presentations and an extensive display of photos, documents and military maps related to WWI. Among those are two panoramic views of the area. The first was taken during the battle and the second taken in recent time. These will help you understand the troops’ movements during the attack. A small path leads from the centre to the Memorial's grounds via a large semi-circular area bordered with hedge. The impressive arched silhouette of the memorial stands against the sky and dominates the top of the ridge. 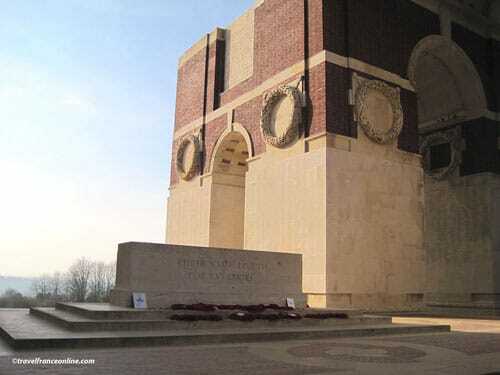 Its pillars are crowned with sculpted wreaths of laurels engraved with the names of the various battles of the Somme. Each arch's face is engraved with the names of the Missing Soldiers who Fell during the Battle of the Somme and have no known grave. Each arch's face is dedicated to a Regiment. The names of each Regiment' Missing Soldiers' are engraved according to their rank within their Regiment and in alphabetical order. There were 73,357 names engraved on the Memorial on August 1, 1932, the day it was unveiled. However, the numbers have since dropped to 72,116. Indeed, the remains of over 1000 Soldiers have since been identified and therefore considered as no longer 'Missing'. A few names, which had been overlooked in 1932, have also been added since. Thiepval Memorial bears the names of Commonwealth Missing Soldiers, with the exception of the Canadians and Newfoundlanders. These men have their own memorials in Vimy Ridge Canadian National Memorial and Newfoundland Memorial Park in Beaumont Hamel. The British-French Cemetery was open after the edification of the memorial. The purpose of this joint cemetery was to symbolize the losses suffered by both nations. It indeed shelters the graves of 300 Commonwealth and 300 French Soldiers. 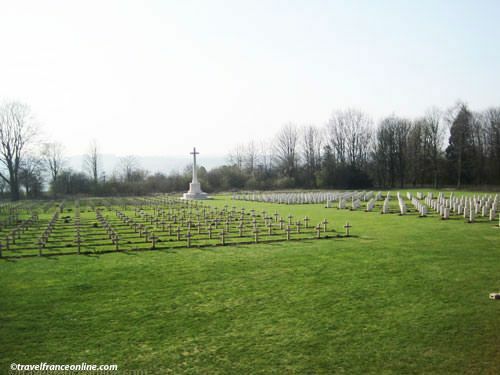 Most of the Commonwealth Soldiers buried there fell during the Battle of the Somme. 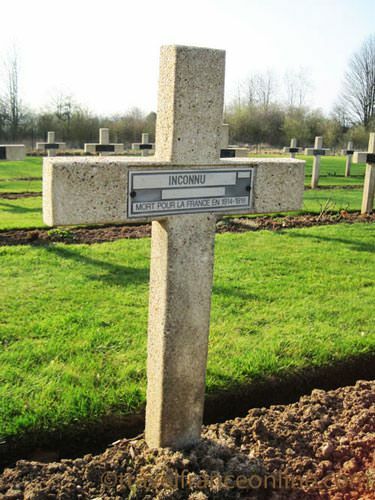 Some were brought back from field burials located in Loos and Le Quesnel farther north. 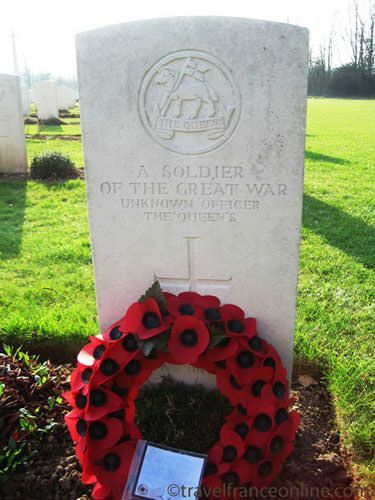 Only 61 Commonwealth soldiers and 47 French soldiers out of the 600 men buried in the cemetery have been identified! The Cross of Sacrifice is located at the end of the central alley and faces the Memorial. "That the world may remember the common sacrifice of two and a half million dead, here have been laid by side soldiers of France and of the British Empire in eternal comradeship”. In 2006 the Prince of Wales laid a wreath on the occasion of the ceremony commemorating the 90th anniversary of the Battle of the Somme. He did so in the presence of thousand people, including one of the few remaining Great War Veterans Henry Allingham. As you exit the Memorial grounds you come across an obelisk at the end of a wide alley cutting through Thiepval Wood and near the main entrance. This Obelisk Memorial to the 18th Division was placed on the site where the men launched their assault on Thiepval village.